Rare-earth minerals are a particular type of commodity that, because of their atomic number (their place in the Periodic Table of the Elements) have characteristics that make them the essential ingredients for the production of such things as lightweight, very long life batteries, lightweight magnets, catalytic converters, flat screen TVs, lightweight but strong metal components, mobile phones and a host of other devices and materials that are needed for modern living. Because they are not as concentrated in ore deposits as are the more traditional hard commodities, such as copper and iron, they are difficult and expensive to mine. As can be seen from the chart above, in 2011 traders in rare-earth minerals, mainly on the futures markets, got quite excited about the perceived potential of such desirable commodities. Since then the price has come back to more realistic levels. The general collapse of commodity prices in recent times has helped this tendency. 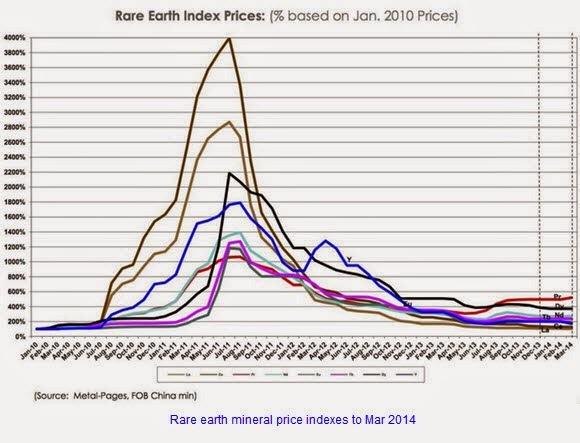 Up to recently, China exported over 90% of the world’s requirements of rare-earth minerals. This has dropped since a dispute with the World Trade Organisation (WTO) over pricing, and the finding by buyers of alternative sources of supply. Chinese exports are now around 86% of global requirements, which is still high. China imposed quotas on the export of rare-earths, but this practice has since been discontinued. Pressure was put on the Chinese by the governments of the US, Japan and the EU, who complained to the WTO. The Chinese idea was to move its utilisation of rare-earths further up the supply chain. Instead of exporting the raw commodities, it sought to incorporate them in their own hi-tech manufacture and export the value-added finished products instead. It is hard to blame them for that.